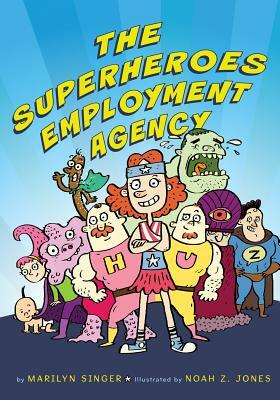 From Blunder Woman and Muffy the Vampire Sprayer to Stuporman and The Bulk, meet the members of the Superheroes Employment Agency—lovable misfits with oddball powers who make up for their lack of fame with an eagerness to please and a can-do attitude. These humorous, kid-friendly poems are sure to entertain while introducing readers to poetry in a fun, lighthearted, and accessible way. Told in Marilyn Singer’s witty verse and Noah Z. Jones’s hilarious illustrations, their story will make you laugh and cheer on these champions in their quests for heroic jobs. Noah Z. Jones has illustrated several picture books and early readers. He lives in Los Angeles, California, and created the animated series Fish Hooks, Almost Naked Animals, and Pickle and Peanut for The Disney Channel and The Cartoon Network.